Easing the fears of landowners is a major goal of those planning a trail from Red Deer to Sylvan Lake. Central Alberta members of Alberta TrailNet are looking at turning an old CP Rail line into a path for cyclists, hikers and even skiiers. But CP Rail won't sell or lease the land until landowners support it, said Gary Poliquin, a director for Alberta TrailNet. Some landowners fear vandalism will rise. "The abandoned rail line is now used for parties and vandalism," said Poliquin, following and Alberta TrailNet conference in Sylvan Lake this weekend. He believes problems will decrease if more people converge on the area. "People who cause vandalism don't want to be seen," said Poliquin, noting vandalism dropped in areas with trail networks like Ontario. Local members have begun talks with landowners and are trying to educate them. About 40 landowners have land beside the rail route. Members want to calm concerns that city folks will infringe on rural areas. "We look at it (the trail) as an opportunity for people to see some of the most beautiful areas of Central Alberta," said Poliquin. The scenic rail route passes over a train trestle. 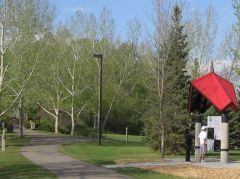 Alberta TrailNet is dedicated to developing a provincewide system of trails. Similar work throughout Canada is expected to eventually lead to a coast-to-coast trail. Construction is now underway on a 12-km stretch of trail to link the trail systems of Banff National Park to Kananaskis Provincial Park. "There are lots of little trails and we need to put in the links to put them all together," said Poliquin. A project to link Drumheller to Carbon with an old rail line is now being organized. Poliquin believes the trail from Red Deer to Sylvan may be built in three to five years. 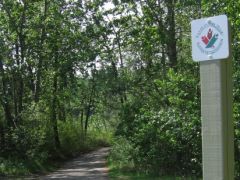 A trail from Red Deer to Blackfalds, along the C & E Trail, is also being considered. The Central Alberta zone of Alberta TrailNet is applying for society status and will begin fund-raising. Nationally, about $2 million has been raised for trails.